We are curious girls and we love experimenting with the presents we get. This time is is a really funny gag, but reaaaally funny. 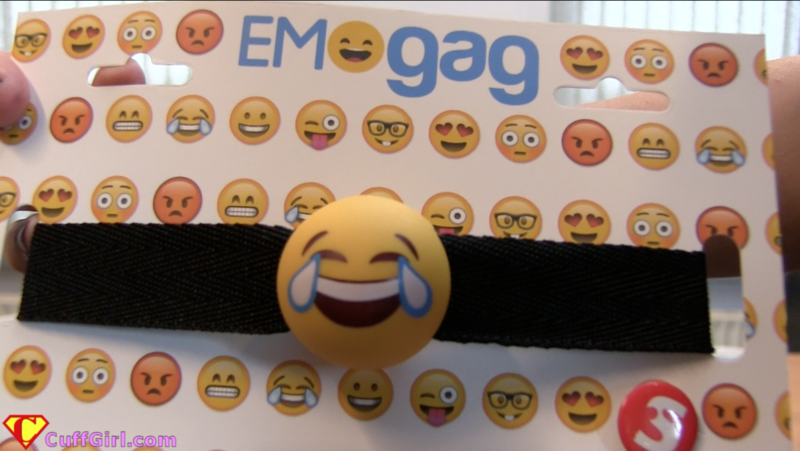 The gag itself is laughing, like the LOL emoji! LOL! You know we are more into cuffs than anything but from time to time is good to experiment with something else (while also using cuffs of course, otherwise what’s the point?). I bet you haven’t seen a gag like this. Thank you to the fan who sent it to us! Then it started to rain very very hard… so this one was kind of cut short. But I will definitely do it again, because I love taking cuffed walks! Any suggestions for my next cuffed walk can be posted below! I received some questions about my Irish 8 handcuffs, so I decided to show them again in a webcam video. I love these cuffs so much, I actually want to get a second pair. They are very heavy, but comfortably smooth. But the most important thing about them is: they snap shut so quickly! It’s click and you’re screwed! No ratchet, no adjusting. Of course, you have to get the right size for your wrists (I have the lady size, LOL I’m a lady). I will show you how to lock them on yourself, and escape again. It is harder than you think! What cuffs do I sleep in? A nice question from a blog reader: ‘What kind of cuffs do you usually sleep in, Chrissy?’. Well, usually none (sorry to disappoint you). But I have tried sleeping cuffed. It was a little awkward at first, waking me up lots of times during the night, but after a few practise nights I can now sleep normally in cuffs. Leg irons and handcuffs, of course! As I found out, it’s important to double lock them! You can probably imagine why that is. I prefer to sleep with my hands cuffed in front, but I have done a few nights behind my back too (not as comfortable). Who knows, I might even try taking a nap hogcuffed in the future! Yeaaah it’s Christmas! I hope you will all receive many gifts (handcuffs, of course), but don’t forget to give something back too (more handcuffs, obviously) LOL :-) I wish you very happy holidays, don’t think about your daily stress, sit back and enjoy this update, drinking hot chocolate and watching me decorate my ChrissyMas tree. I think it is the best tree ever! Merry cuffing!! Here is a question I receive very often: ‘Do you really do everything in handcuffs?’. Well… no… but I can do a lot of things in handcuffs, often without even realising my hands are restrained. I have tried showering in cuffs many times. It’s easy, if you pick cuffs that will not rust ;-) This week, I will demonstrate how I take a quick shower. Try this at home! Just study my pictures and video and you will be a cuffed shower expert in no time LOL! Here is part 2. I am again cuffed to the chair, but now the key is frozen (yes, frozen) inside an ice cube dangling from the ceiling. A lot of fans have emailed me about frozen keys, and I never understood the challenge in this. Now I know… you have to WAIT for the ice to melt. And I am not good at waiting… Fortunately, you forgot all about my smoking habit, I always carry a lighter ;) But melting the ice was harder than I thought… This was a fun challenge! Please send me more! It seems people want to see me in all kinds of restraints. I only like metal ones, so please don’t ask me about leather or ropes. I feel really lucky that a lovely webmaster has sent me a RigidStock to borrow for a while! It is such a cool thing! It feels great to be restrained in it, and it’s really comfortable! The wrist inserts even turn! Sadly I can never afford such a beautiful thing, so I am going to enjoy the time I will have it here at home. In this update, I will try to drink a glass of cola. Sounds simple, but it is not!